At the end of the penultimate day's play at the new Optus Stadium in Perth, Australia continues to exercise their dominance over the visitors. Team India is five wickets to chase down a deficit of 175 more runs, to win the game tomorrow - as of now, not many odds of that happening. Earlier, Australia resumed at 132/4 in their second innings and enjoyed a whole wicketless session as Khawaja and Paine took the score to 192 runs. 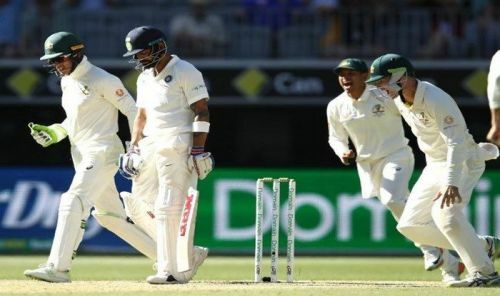 Things changed immediately afterward, Shami coming up to remove Paine and Aaron Finch, followed by Cummins who was cleaned up by Bumrah and Khawaja who was dismissed by Shami, all within a space of six more runs. Lyon departed as the ninth scalp, at 207 runs but then Starc and Josh Hazlewood combined to produce a 36-run stand, that eventually took the overall Aussie lead to 286 runs. India lost Rahul and Pujara by the time their reply score read 13, and despite the odd 30-40 run stands between Vijay and Kohli, and later by Rahane and Vihari, the side hasn't recovered. Their final score at the end of the day reads 112/5, 175 runs short of a win. Mohammad Shami was good enough with the ball in the series so far, but his effort remained incomplete because of the lack of due rewards. The "issue" has, at last, been sorted as Shami eventually finished with his best-ever Test figures, 6/56. 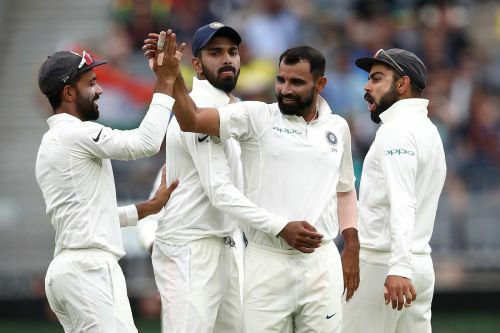 Shami used the short ball to good effect, and the uneven bounce effected by the greenish Perth surface did its job as well. Aaron Finch, Usman Khawaja, Shaun Marsh, Tim Paine, and Travis Head were included in the list of players who were deceived by the pace and bounce, all of them eventually ending up inside fielders' palms. Ishant Sharma and Jasprit Bumrah, who for their own merit, bowled well in the first innings, may as well take a leaf out of Shami's book when it comes to using the short ball. On the other end, Umesh Yadav made an uninspiring performance with the ball and should look to read the pitch and bowl more in favor of it.